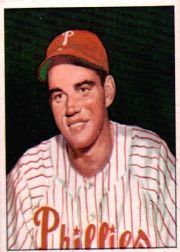 The 1950 Phillies “Whiz Kids” team lives on in the minds and hearts of fans and collectors, thanks to proud alums like pitcher Bob Miller, who furnished a kind reply to my questions. First, I wanted to ask if he ever imagined himself going to the World Series in his first full year. I asked how he felt about the results of the 1950 National League Rookie of the Year balloting. The 11-game winner finished second in votes to Boston Brave Sam Jethroe. This answer floored me. Today, agents would have incentive clauses getting bonuses for a player who finished so high in the vote totals. Lastly, I thought I’d point out that I knew WHICH pitcher Bob Miller I was addressing. I asked Robert John Miller for examples of getting mixed up with the other two “pitcher Bob Miller” late arrivals. “Yes, I met both Bob Millers. They became good friends.